Weil’s disease is a form of a bacterial infection also known as Leptospirosis that is carried by animals, most commonly in rats and cattle. It can be caught by humans through contact with rat or cattle urine, most commonly occurring through contaminated fresh water. Although human infection in the UK is minimal it is still worth taking some preventative measures to decrease the possibility of contracting it. Symptoms can occur between 3 and 21 days from the time of infection. There can be two distinct phases of leptospirosis. Symptoms are similar to those of the flu, including high fever, severe headache, chills, muscle aches, and vomiting, and may also include a rash. It may last between 3 to 5 days before recovery. In mild cases the patient will recover after just the first phase but they can suffer fatigue and depression for some time afterwards. Initial symptoms will reoccur. Further symptoms can vary according to severity and may include jaundice (yellow skin and eyes), red eyes, abdominal pain, and diarrhoea. Symptoms can be similar to those of meningitis. Severe cases can also cause the failure of kidneys or liver. Death can occur due to heart, liver or respiratory failure. Cover any open wounds such as cuts and scratches with waterproof plasters. Wear protective clothing such as gloves. Wash thoroughly and as soon as possible if you have entered the water. Assess the risk of the likelihood of contamination if contemplating entering fresh water, particularly be aware of stagnant water. Carefully clean any open wounds obtained during time at fresh water. If symptoms occur, seek medical treatment and explain to the practitioner that you have been in contact with open water. Early diagnosis and treatment of Leptospirosis can prevent more severe cases of infection. Members are reminded that below the clubhouse are several potentially fatal weirs. If in doubt do not paddle. Novices must first prove they can exit boats confidently in the pool before embarking on any activity. Never alter the outfitting in a craft without experienced advice. Anyone who purchases a new boat is advised to seek assistance and check they can confidently exit the vessel before embarking on any activity. Always check yours and other peoples spray deck loops are showing and not tucked inside. Always dress appropriately for prevailing weather conditions. Carry suitable equipment, clothing and food depending on the type of activity is to be undertaken. Never paddle whilst under the influence of alcohol or any drugs which may cause side effects. Be honest with yourself, do not exceed your paddling ability. Always paddle in groups of three or more. Remember your actions directly affect others you paddle with, and therefore the safety of any group must be paramount. Junior members must paddle with a parent or guardian unless they have filled in a consent form. AFTER ALL THAT, DON’T RUN AWAY! 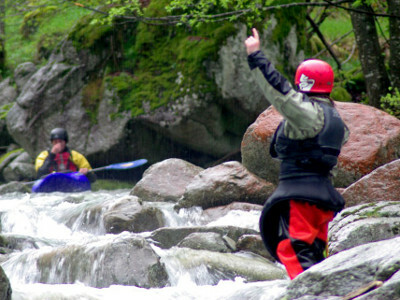 Paddling is a fun sport, it’s adventurous, technical, social and damn right wet, so go for it. Enjoy Yourselves Folks.